Listen to Paxi the Alien talk about the Sun, the closest star to Earth, and why we have day, night and seasons. Find out about looking at stars in the night sky, and how groups of stars can be joined up to make patterns called constellations. What is the Sun made of? How did astronauts get to the Moon and what did they find there? 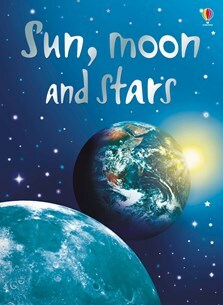 For children beginning to read on their own, this book is an exciting introduction to space. Vivid, full colour illustrations and photographs on every page. The images are lovely and big, with very clear accompanying text, and each page also has a small illustration with a 'did you know?' type fact to go with the chapter. The glossary at the back is also great as he can work out the main word, and then go on to tell me all about it which is a fun memory exercise. This is suitable for children in KS1/5yr+ but my inquisitive 4 year old son has enjoyed going through the book and listening to it as much as his 6 year old sister. The book is internet-linked which provides games and activities linked to each topic. The relevant web address is shown within each topic. There are also links to websites for related animations, games and downloadable pictures which could be used for homework. This has been my son's favorite book since he was two years old! I bought it through a Scholastic school book order, intending to save it until he was older. But he wanted to read it, was utterly enthralled with it, and had it fully memorized within weeks. This book sparked an interest in space that has stayed with him (he is now four). He found the book clear and easy to understand and was able to answer 'reading comprehension' style questions such as 'Which planet is the biggest?' and 'What is the sun made of?' Wonderful! I plan on collecting as many of these Usborne Beginners books as I can! I had to write and let you know how wonderful the Usborne Beginners series has been for my 4 year old son's education. I bought sun, moon and stars, read it to him once thinking he would not take anything in and would only look at the pictures, and the next day he was quoting bits back to me and asking questions. He demanded it as one of his bedtime books so many times I got bored and bought another in the series – your body. It had an equally great reception and I am now collecting the whole series. Well written, easy to read and great illustrations.